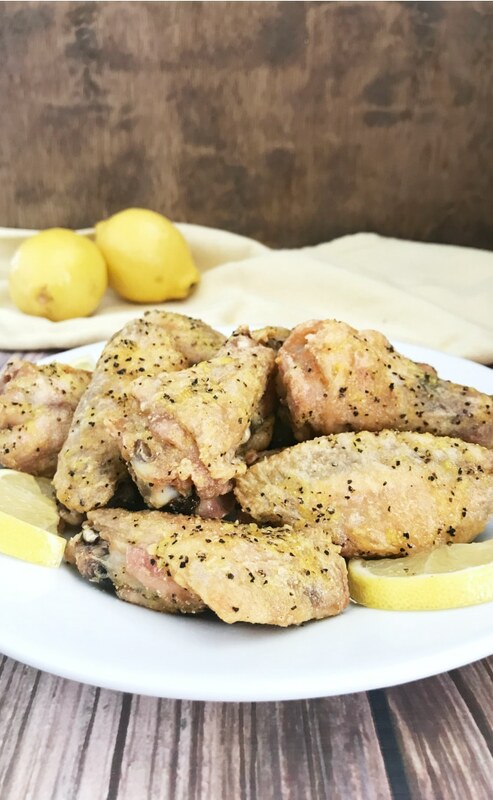 These Lemon Pepper Chicken Wings aren’t coated in sauce but you’ll have to try not to lick the plate when you taste this homemade lemon pepper seasoning. If you think you’ll only get crispy chicken wings if they’re deep fried, you’re mistaken. If you also think buffalo sauce is the only delicious topping for chicken wings, you’re doubly mistaken, although we do think our Buffalo Wings are pretty amazing. What if I told you crispy chicken wings can be made in the oven and you’ll be licking your fingers clean and it’s not from buffalo sauce? If you think you’re dreaming, think again. We’ve mastered getting the crispiest, golden(est) chicken wings without using a deep fryer. I’ll keep it straight and to the point in this post, but if you want to read the full instructions and watch a video on how to do it, click here. Spoiler alert: the secret ingredient to crispy baked chicken wings is baking powder. Crazy, right?! But it works! 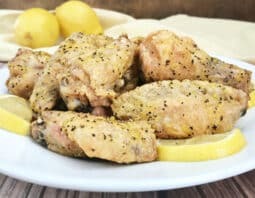 This baked crispy lemon pepper chicken wing recipe calls for homemade lemon pepper seasoning (recipe below), but you can easily sub in the same amount of store-bought equivalent. Making your own at home allows you to tweak and customize how much of each flavor component you want (i.e. if you like a strong lemon flavor add more lemon zest, or if you’re watching your sodium intake decrease the amount of salt). Adding homemade lemon pepper seasoning along with melted butter onto your baked crispy chicken wings is a game changer! Like I said before, finger-licking good. Buffalo sauce what? You won’t even miss it after trying this recipe. Preheat oven to 250°F. Place a cooling rack onto a baking sheet and spray with nonstick cooking spray. Set aside. After cutting the wings into flats and drumettes, place them into a large bowl and toss with baking powder and salt. Transfer wings to the rack in single layer and bake for 30 minutes. When 30 minutes is up, leave them in the oven and increase the temperature to 425°F. Continue baking an additional 40-50 minutes, or until crispy and golden. Remove from the oven and let cool 5 minutes. Toss with melted butter and lemon pepper seasoning. Serve and enjoy! Preheat the oven to 200°F. In a medium bowl, zest the lemons and mix with the black peppercorns. Spread the mixture onto a baking sheet. Place in the oven and bake for about 1 hour or until the lemon zest is dried. Transfer the lemon zest and peppercorns to a food processor or spice grinder. Blend/grind until the zest and peppercorns reach desired texture. Add in the salt and pulse or stir to combine. Store in airtight container for up to 4-6 months.